- Is Your iPod or iPhone Looking Too Modern? 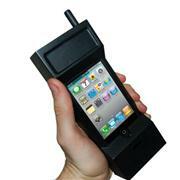 Give your iPhone a retro 80's look with this iPhone case. Looks like the old classic phones you used to own! It also works as a fantastic phone stand. By today's standards, you'd be forgiven for mistaking a 1980s mobile phone for, well, a house brick, but back in the day these chunky must-haves were the ultimate status symbol! We've come along way in terms of streamlined modernity and fancy features since then, but the 80s mobile remains a design icon in its own right. And with this funky phone case, you can get the best of both worlds. Simply slot your iPhone into the custom-made holder and capture the look and feel of the 1980s 'house brick' without losing any of your 21st-century specs! 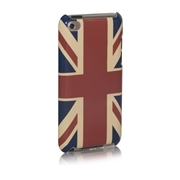 Store and Protect your iPod touch 4G with this iconic retro union jack design. The case features a simple clip on design and allows access to all your functions. The case features a camera hole so you don't have to keep taking your iPod touch 4G out of the case. You have full access to the side buttons as the case is designed with the iPod touch 4G user in mind. The pack also supplies you with a Bonus screen protector & cleaning cloth. 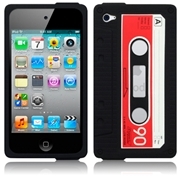 Protect your device with this soft cassette tape design silicone jacket. Made of high quality flexible silicon with cut-outs for essential functions. Very lightweight and great protection. The skin is covered with a clear protective layer for ultimate durability. High quality thick silicon skin provides the ultimate buffer for protecting your device from bumps and knocks.